We saw many Bibles of ordinary sizes. It is surprising to know that there is a largest bible in the world, which weighs 3000 kilograms with a height of 8.2 feet, on the other side smallest bible that is only our thumb nail’s size. In Los Angeles of USA, some enthusiastic persons came forward to make a bible with wood. After 2 years of continuous hard work, they finished the wooden Bible. Every page of that Bible is made with a thin sheet of wood. They engraved sentences of God on those wooden sheets of 3 feet height. There were 8,048 pages in this wooden Bible. 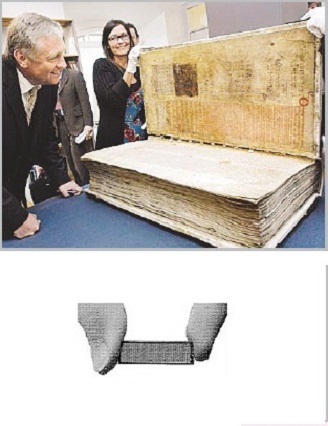 This Bible weighs 3,015 kilograms. It has a width of 8.2 feet. And this was the largest Bible in the world. In olden times, God’s sentences are written on papers made of skin. Now in this computer era, Bible was printed on silicon chip. Its size is equal to thumb finger nail’s size.